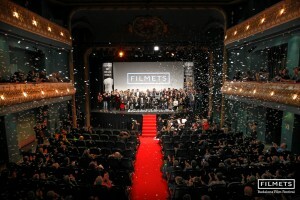 The 41st edition of the FILMETS Badalona Film Festival took place from 20 to 28 November at the official headquarters of the Zorrilla Theatre, the Teatre Principal, the auditorium of the Joan Maragall C.E.S., the Centre Cívic La Salut, the public libraries of the city and, for the first year, at the French Institute of Barcelona, that will be offering a screening from the international programme with French short films in competition. SWITZERLAND, with its long tradition and support to short films, was the guest country, with the collaboration of SWISS FILMS, Consulate General of Switzerland in Barcelona and Switzerland Tourism Office of Barcelona, among others.Short films from this country have participated within the last years in the most important international festivals, such as Locarno (class A festival), the reputed Animatou in Geneva or Kurtzfilmtage Wintertur, among others. 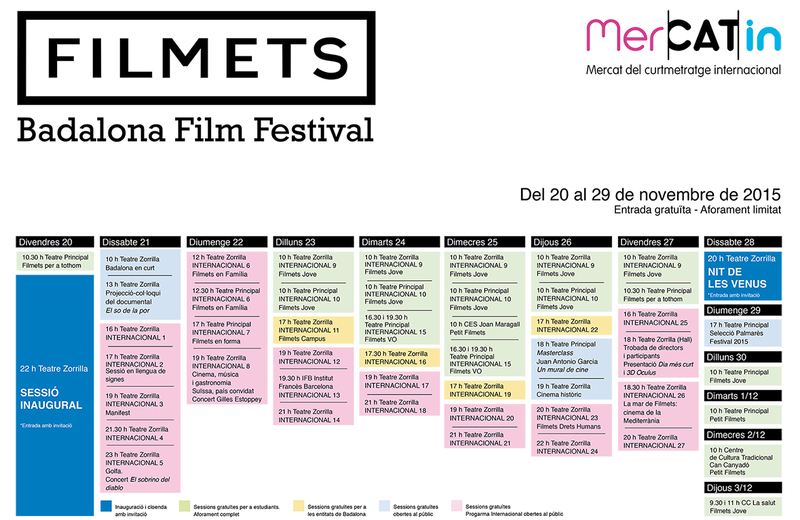 FILMETS Festival has organized information activities throughout this year in Catalonia, as well as retrospective sessions of Catalonian short films in festivals such as the REGARD in Quebec (Canada), the UNLIMITED Erice in Sicily (Italy), the MÈDIT in Ciutadella de Menorca, the Cinema Museum in Gerona, the fair Connect’Art of Young Creators in Badalona, the Cinema Lliure a la Platja de Barcelona, the Francophonie Week at the French Institute of Barcelona, EL DIA MÉS CURT, the MOST de Vilafranca del Penedès and the Festival Cinéma des Peoples in Morocco. The International Program, central axis of FILMETS, comprises up to 255 short films from 48 countries. These films have been selected to compete in the Festival of this year among more than 4.500 enrolled short films, and will be shown along the week distributed in 27 different competitive sections. The cover of the catalogue and this year’s official poster was designed by Ana Meléndez Fernández, student of 2º course of Gràfica Impressa at the Escola d’Art I Superior de Disseny Pau Gargallo of Badalona. For the last editions, FILMETS has also reached nurseries of kids from 1 and 2 years. Sincelast year, a new programming projectis aiming at reaching kids in Primary Education as well, with very successful participation rates. This year FILMETS has also collaborated with Videovalues, where young unemployed people have participated in video workshops (also with the collaboration of Obra Social La Caixa), making it possible for the best short films to be screened on the 41st edition of Filmets Film Festival for the first time. This collaboration boostedthese people by allowing them to share experiences with film producers and directors and show their work. Besides, a new project in collaboration with Badalona’s language schools is beginning, that intends to create a screening session named FILMETS O.V., with filmspresented in their original version and subtitled in Catalan. Cinema, música i gastronomia: Suïssa, país convidat: international programme session dedicated to short films awarded by the most important film festivals worldwide. performance of the band Gilles Estoppey. Manifest: political and claim short films. Sessió golfa: the most radical and daring short films. This session will be preceded by EL SOBRINO DEL DIABLO musical performance. 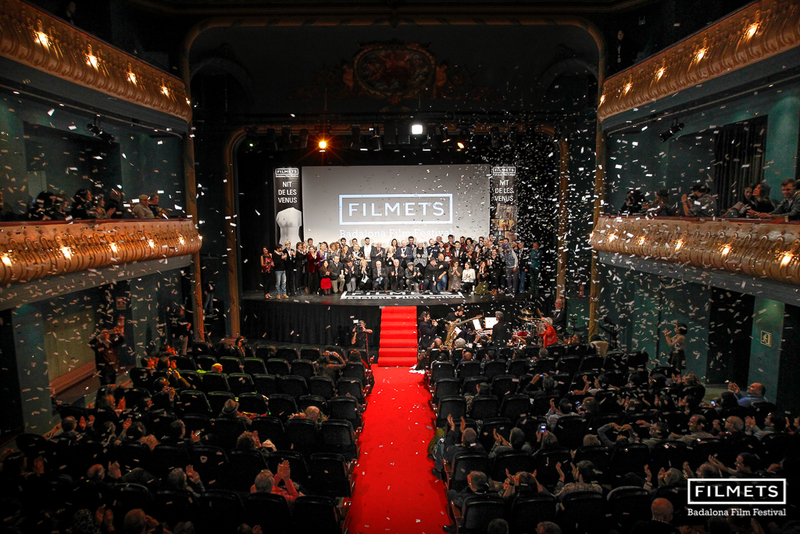 La mar de Filmets, cinema de la Mediterrània: screening session dedicated to the Mediterranean countries’ filmography. Drets Humans: short films with social commitmentvalues in collaboration with the Federació Catalana d’ONG per la Pau, els Drets Humans i el Desenvolupament. Filmets integra: special sessions for each group, with more than 7.000 students: Filmets en família, Filmets jove (students from Primary and Secondary School), Filmets per a tothom(people with disabilities), Petit Filmets (nurseries and students from Primary Schools), Filmets a les biblioteques i Centres Cívics and Filmets campus (productions from Catalonian and European Cinema Schools). As well as a screening session with sign language. Masterclass: With the painter Juan Antonio García: A life painting dreams. Expert in cinema posters, cinema lover who has transferred his passion to his children. Juan Antonio García is the father of film director J.A. Bayona. Cinema històric: recovery of Badalona’s film heritage,this year is dedicated to a series of documentaries and religious processions that took place in our town between 1950 and 1970, directed by Eladi Segundo Puells y Josep Parra Estévez. Badalona en curt: projection of short films made by the Badalona citizens will take place Saturday November, 21 at the Zorilla Theatre. This year there are 13 films on competition and 4 on the Official Section. Filmets en forma: short films about the world of sport, in collaboration with BCN Sports Film. Projecció-col·loqui: screening and round-table on the documentaryEL SO DE LA POR, produced byTelevisió de Catalunya, an exploration of the importance of sound in fantastic cinema, will be presented by their creators. This year a new tag will be available on the festival’s website to provide credentials to directors, actors and media representatives. Media representatives can access all the screenings with their press cards. It also gives them right to attend the opening and closing ceremony, where media agents are expected to show their cards.